Honey Ryder - alive, seeking revenge. It was the latter part of 1962 and I had just graduated from a boarding high school, St. Edward’s in Austin, Texas. I was confused and had no idea what to do with my life. So I crashed in my mother’s house in Veracruz, Mexico. Her house was also the one-room schoolhouse for the children of the engineers and employees of Alcoa Aluminum. My mother was the teacher. My mother had two American friends who came to visit to play bridge. The fourth player was a German woman who drove one of those Toyota Land Cruisers and had a shop in downtown Veracruz that sold Mexican curios. When the woman of the Toyota could not make it I was lured as the fourth partner. I was taught to play the game. I could not know then, I was much too naïve, that the pair were lesbians, and probably the Toyota gal, too and that somehow Alcoa did not have any issues with my mother having such friends. The pair were the ones who introduced me to the James Bond novels of Ian Fleming. I had seen Dr. No (yum, Ursula Andress as Honey Ryder) in one of the port’s movie houses and I was so excited that I was lent one of the original pocketbooks that were being published at the time. As they came out, the two women would pass them by me. I read them all. After our bridge sessions I would retire to my hot and humid room and read the novels until dawn. We discussed plots over subsequent bridge games. I came to respect, admire and love these two women who (and I feel most lucky) introduced me to the books of Ian Fleming. I have always thought that the writing should precede the moving image. An of course since my mother was an Eric Ambler fan, she read the Bond novels. 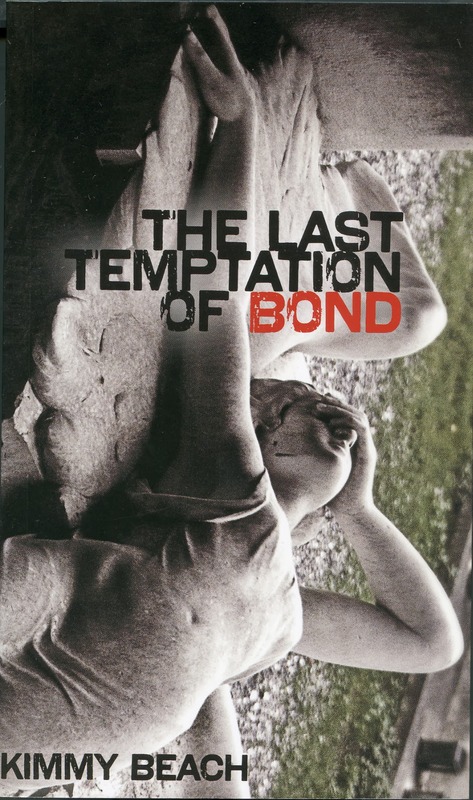 In that light I am delighted to inform any who might be reading this that there is a new and exciting book on things Bond, The Last Temptation of Bond. It is written by one of our Canadian poets, Kimmy Beach who lives in Red Deer, Alberta. On CBC Radio (bless them in spite of an ever diminishing profile) on Shelagh Rogers (whose melodious voice is almost, but not quite as good as her mother’s) The Next Chapter I heard her interview Beach yesterday. It seems that Beach became quite obsessed, early in her life with James Bond films. Her fave James Bond, after considering Sean Connery at length is Daniel Craig. She mentioned that Ian Fleming himself thought that Hoagy Carmichael's looks matched his idea of the perfect James Bond. In this book of wonderful poetry on all things Bond, Beach invents a few what-if situations and also a very exciting but mysterious woman she calls One. In the interview she mentions the least popular and almost unknown Bond, George Lazenby On His Majesty’s Secret (1969). I find that hard to believe if you are a fan (and I am one) of Diana Rigg who plays Bond’s bride and who does not survive her day in church. I have purchased the book at Chapters which after reading will present as a gift to my 16-year-old granddaughter Rebecca who has seen all of the James Bond films. I am sure that this book will delight her. the secrecy. And I hate James.